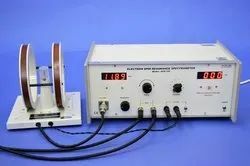 We offer to our clients a wide range of physics lab trainer that are highly efficient and are widely used across various industries. Brand: Mechanics Optics & Digital Instruments Pvt. Ltd.
Make : Mechanics Optics & Digital Instruments Pvt. Ltd.
Electron spin resonance spectrometer (complete laboratory equipments). Major advantages of Spun Converters & Resonators are elimination of welding process & reduction in material content. It can be produced with offset technology also. They are most efficient in terms of packaging & durability point of view. Nvis 656 Spectrometer Setup is useful for understanding the behaviour of light and it concerns with the phenomenon of Reflection, Refraction, Diffraction and Interference of light. Optical spectrums are important for the detailed description of light source and wavelength determination for each colour of light.